You just arrived in Morocco and wonder which desert trip in Morocco is the best option? If you can relate to this question, this article will contain some helpful information for you. As soon as we arrived in Marrakech, we asked ourselves the same question. A desert trip to Zagora or Merzouga? Two days or three and what exactly is a stone desert? 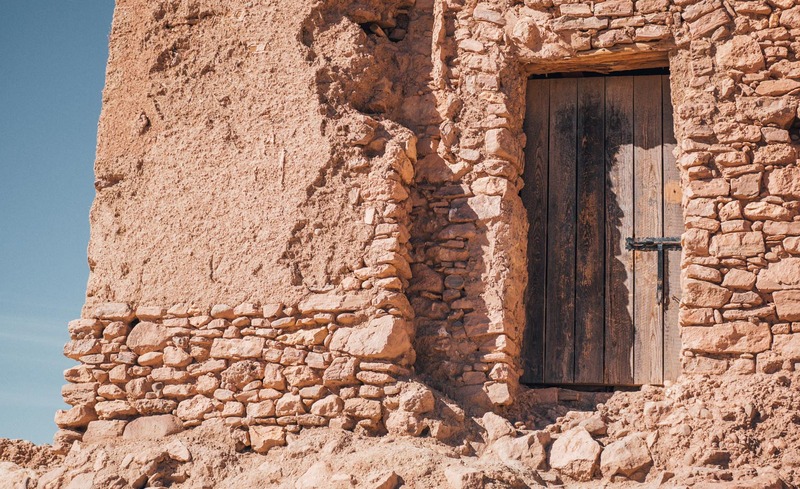 To make sure that you have the best possible desert trip in Morocco, we wrote this article. Bright stars during freezing nights and a warming tea on a dune after a cold night in a tent. Riding camels through the sand and witness a sunset with sand the only thing surrounding you. We were also eager to experience all that. As soon as we started researching we came across a gazillion tour operators that all offered similar trips and became uncertain. Now – after our trip – we know much more than before. Actually, we are not the biggest fans to share all details with our dear readers, as a bit of uncertainty should be part of the adventure. In this case, however, it makes sense to share more information as you should determine where you want to go to – Zagora or Merzouga? 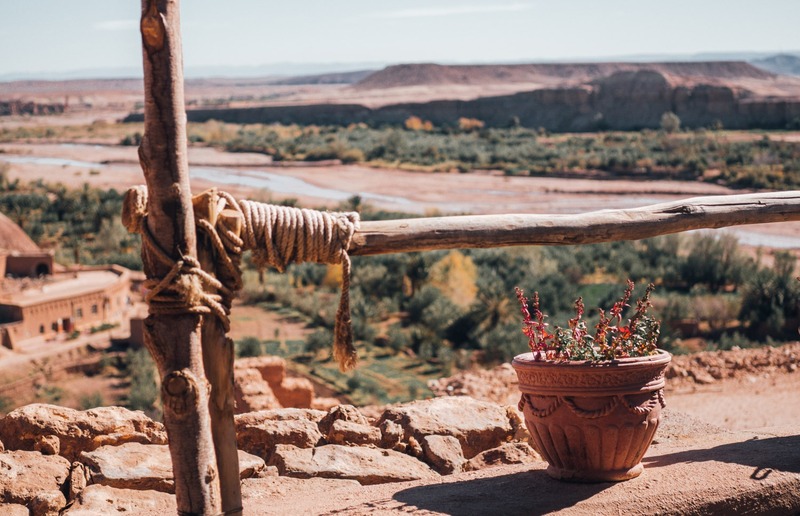 When you are short on time, people and tour operators will recommend a trip to Zagora, as it’s doable as a two day, one night trip. Zagora is a city located at the beginning of the desert, 220 miles southeast from Marrakech. To get there you need to pass the high Atlas which makes it a seven to eight-hour curvy drive. For us personally, everything but relaxed! On the way there, drivers will stop multiple times to eat, rest and enjoy the incredible views on mountains with snowcaps. The desert in Zagora is not the desert you might expect with huge dunes and sand as far as the eye can see. It’s a great spot to get a feeling on how “real” desert might feel but locals call it “small desert” for a reason. Merzouga is located 350 miles east from Marrakech and a city in the desert. The nine to ten-hour drive will be split in two days with an overnight stay on the way. That’s why it takes one day longer than a trip to Zagora, making it a three-day trip. The town, a few miles off the Algerian border is known for its high dunes and sand as far as you can see. Trips to Merzouga are, due to its distance from Marrakech, a bit more expensive. 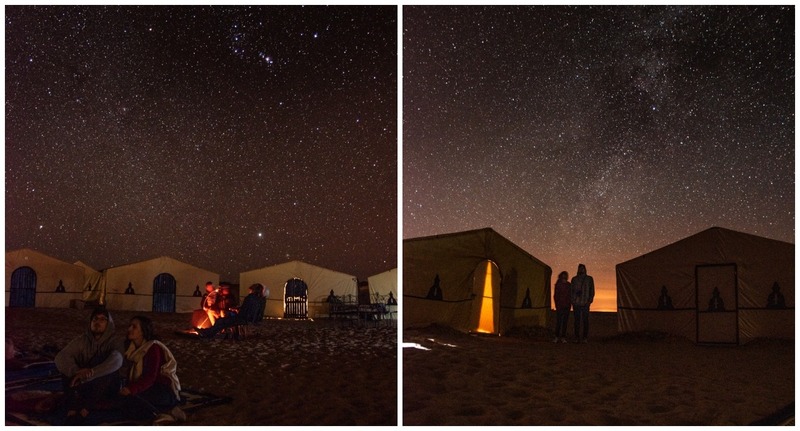 The Scarabeo Camp is located in the Agafay desert, certainly looks fancy and got famous through Instagram. The company that organizes tours seems to have a strong “Instagram Influencer” strategy. Meaning to say, Instagrammers with a big audience get invited for free to shoot here and tell their followership about their time. The Scarabeo Camp is not located in a “real” dessert but in a stone desert close to Marrakech, so actually hard to compare with Merzouga and Zagora. We also considered a trip to Scarabeo, but after we saw some more pictures, we were happy that we didn’t make our way to the stone desert. We wanted to witness real dunes and nomads living in the desert, learning about their culture and minimalist life. Just to give a feeling for the distances, here a map with the three mentioned locations. When strolling through the maze of streets in Marrakech you see many operators that offer trips to either of the above. The prices on the streets are about the same and don’t massively differ to from each other and are comparatively cheap. We paid 50€ per person for our two days trip to Zagora, including transportation and the accommodation in the desert. 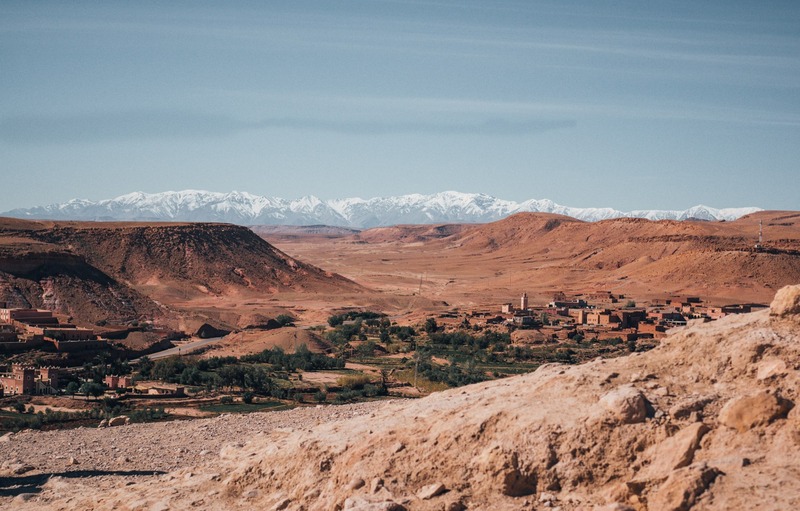 A comparable trip to Merzouga would cost approximately 75€ per person. All these operators are, frankly speaking, very touristy and make their money with big groups that all stay together in one camp. We, for example, stayed in a camp with a little over 30 people. More on our experience in detail later. 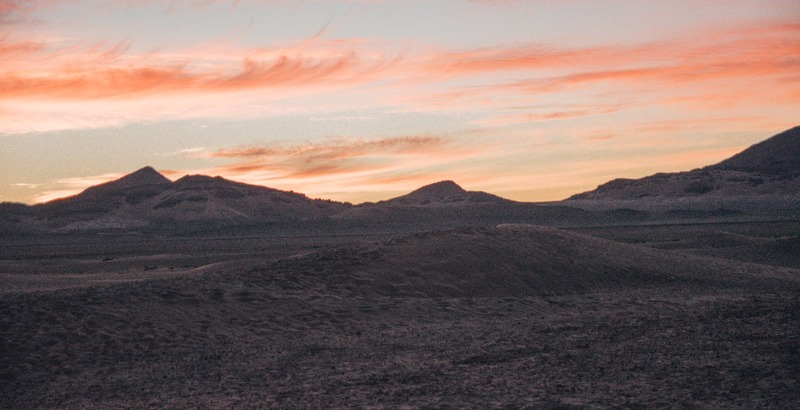 When researching our desert trip in Morocco and asking friends and our followers on Instagram on tips, we got even more options. These recommended tours are significantly more expensive with roughly 200-400€ per person. In our booking process, we compared these tours with the tour operators we talked to on the streets, which certainly was wrong. These trips are not comparable to a group trip to one of the above, but most likely will be a once-in-a-lifetime experience. The approach these tours have is completely different. First, they are private, offering a less touristy experience. Thus, these operators need to earn money with two clients rather than with thirty. Secondly, the tents are not set up in a designated “tourist area” but you rather stay with nomads and experience their way of living. Here you also use their camels and people share stories of their daily challenges. We only had one week in Morocco and due to that were a bit short on time. We thought a lot and researched many options. In the end, we decided in favor of one of the cheaper providers that we got recommended by a friend, who had a great time a couple of years back. First off, the most important: It was the wrong decision. Why? I gotta explain! Our desert trip in Morocco started in front of Café France (a well-known café in the heart of Marrakech, well-known because of its roof-top view). Here we found our driver and the car. Jumped in the car and started the trip with changing a tire at a corner shop close to our starting point. We started driving and approached the Atlas mountains. The views became increasingly beautiful. Parts of the streets were not only curvy but also only gravel roads. That led to slow progress on our way and a second flat tire of the day. The mood was good, so no problem. Some people came over to help and we quickly changed tires. We passed by the mountains, stopped in a little town for lunch and continued driving an hour or two and stopped again cause of flat tire number three. The mood only being mediocre, as we got worried not making it until sunset to the desert. Our driver had to organize a new tire, which didn’t seem easy and soon he became nervous as well and spoke with a louder voice on the phone. With the “new” tire we started to approach the last 40 km and stopped after 5 km again. Flat tire number four! The good mood was gone like the tires on our damn car! Then we arrived! Sunset already almost over, we got our camels and started trotting and it became dark within the first minutes on the back of our new companions. Once we arrived, we saw that many other people waited for us in the camp already. Dinner was served shortly afterward, we chatted with travelers from different parts of the world and sat around the campfire. The day certainly was not one of my favourites but it ended with incredible views on stars without any light pollution. A freezing night came to an end and we got a simple breakfast and explored the nearby dune. The colors in the early morning were beautiful. The camels also seemed to enjoy the first warming sunbeams of the day. Then, the stay was already over and we headed back to Marrakech with 4 new tires around 8 am! On the way back we stopped here and there and explored the ancient city Aït-Ben-Haddou where Game of Thrones and the Gladiator were filmed. Morocco is beautiful, that’s for sure! Around dusk, we arrived back in Marrakech! Note: To sum things up, the company Beyond Travel is the worst ever! Don’t ever book through them. The tires were completely (!) gone and it was not only extremely annoying but also incredibly dangerous to drive 450 miles (700 km) in two days with a tired driver. Zagora or Merzouga? Our suggestion! If you read until here, you will know that we have been to Zagora. For that trip, we choose a hostel in the city center that worked together with Beyond Travel (don’t do that same mistake as we did). Our advice is the following: If you want to experience the desert, plan with three days and take your time. Otherwise, the trip is stressful and not the great adventure it should and could be. An unpaid recommendation we can give are the following three operators of more expensive tours. We did none of them but talked with all three and we honestly think that the philosophy these three guys share is truly great. 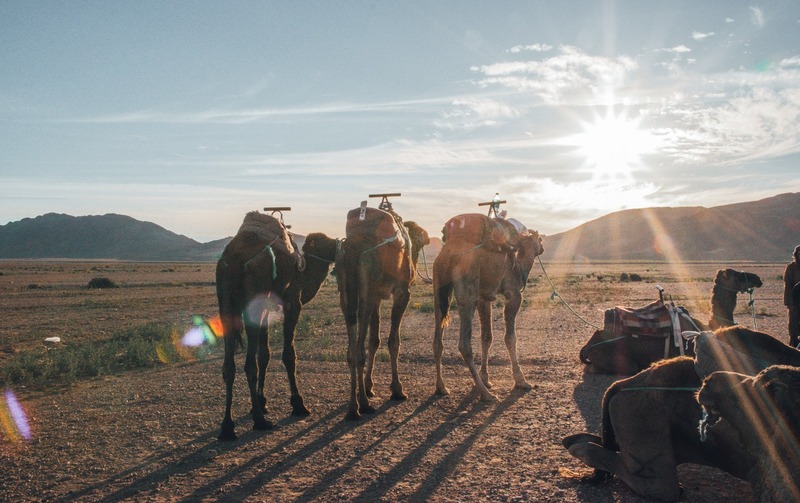 The Morocco Nomads tour is run by Hafid. We spoke to him and he seemed a nice guy. We got this recommendation from one of our Instagram followers. When joining him, you will witness how nomads live in the desert. Certainly a great trip! Here, you can check out his website and here his Instagram profile. While researching we also stumbled upon Day Morocco Tours. When chatting with the operator he made a great impression and told us more about his philosophy. He already warned us prior to our trip that the experience won’t be the best but also said that he can’t compete with the prices due to the fact that his trips are private tours. Certainly recommended as well! 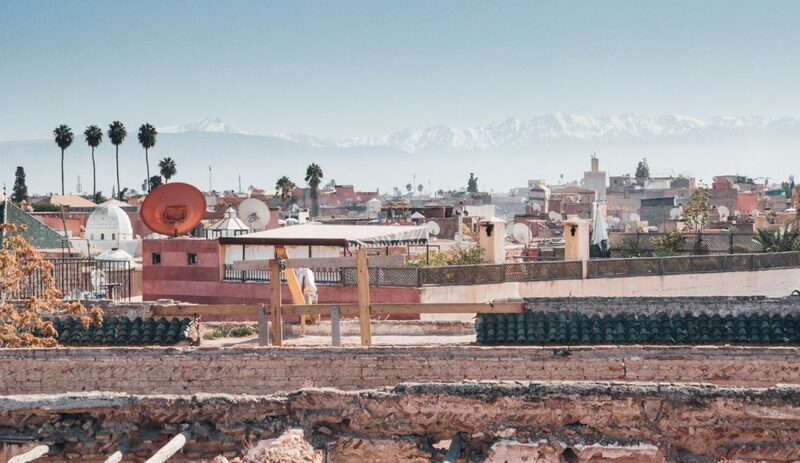 Before our trip, we followed two German guys filming a documentary in Morocco. They spent time in the desert as well and recommended Ali to us. He told us to take time and don’t rush to the desert as this will sacrifies the experience. We should have better listened! Just write him on Instagram. Reach out to one of these guys if you want to experience the desert in a unique way but be ready to pay more than on the streets in these touristy tours. Also, rather save a bit more money at home and invest it wisely in one of the suggested alternative tours. These tours, as above mentioned have a totally different approach. They don’t aim for bringing many tourists from A to B but they want to show how nomads live in the desert. Nothing is “just built for tourists” but you become a part of it and that should be the goal of a trip like that. We regret that we didn’t think that far prior to our trip but now we know and certainly will do it in the future. Even better for you, now at least you know! :) Enjoy your desert trip in Morocco!